William Morrow Paperbacks, 9780061962196, 352pp. 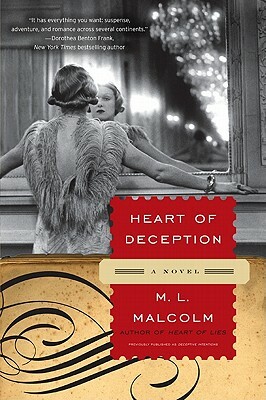 M. L. Malcolm has won several awards for short fiction, including recognition in the Lorian Hemingway International Short Story Competition, and a silver medal from ForeWord magazine for Historical Fiction Book of the Year. Malcolm has lived in Florida, Boston, Washington, D.C., France, New York, and Atlanta, and currently resides in Los Angeles. What is your opinion of Bernice Mason, Leo’s sister-in-law? Were her motives in separating Leo from his daughter altruistic, or deceptive? Similarly, when Amelia informs Maddy about her husband’s infidelity, was she being helpful or vindictive? What explains Leo’s attraction to Christine, given that he knows that she’s not likely to be faithful? Is there anything about their respective characters that make them better spies? What do you think of Leo’s decision to go to France when his actions jeopardize his ability to reunite with his own child? Why do you think he decided to fight in the cold war rather than try to win back his daughter’s affections? Do you think that Maddy’s decision to refuse further contact with her father was the correct one? Why or why not? At Katherine’s graduation celebration, Maddy is envious of her friend’s ability to “never feel guilty about what she wanted, or to fret about the price she might have to pay to get it.” What do you suppose makes her feel this way? As the novel progresses, does Maddy change in this regard? Why was it so imperative that Maddy break off her relationship with Gene? Was it credible that she would rethink this decision later in life? How are the decisions that Maddy makes in her one life similar to or different than the decisions her mother, Martha and her father, Leo made? Do Maddy and Leo go about trying to correct their mistakes in the same way? The author makes substantial use of real historical figures. Do you think she did so effectively? Which was your favorite character (real or fictional) and why? There’s an old piece of advice for writers: “If your plot requires more than two coincidences to keep moving, start rewriting.” Were there any such coincidences in Heart of Deception? Did they seem credible, or contrived? Has your own life or the life of someone you’ve known ever been dramatically affected by coincidence?